Good morning my sweet friends! I hope your days were merry! I can't believe it's almost time to say goodbye (and good riddance) to 2016 and welcome a fresh new year full of possibilities. Do you make resolutions? Pick a word? I never do that myself, but I love to see what people are thinking about at this time of year. We've had some cold frosty mornings lately. Typical fall and winter in California, we're raking frosty leaves till February around here. The weeds are thriving with the rain so my yard is nice and green, looks more alive than it has all year! Are you doing any sew alongs this coming year? The Splendid Sampler is only has a couple of more months to go. I see that Pat has already started to work on something new, and you can follow along with her over at her new website I Love to Make Quilts. Here's the link to the first post about this Solstice challenge so you can read all about it. Trying again! Been having so much trouble commenting on blogger! Happy New Year Pam. We are getting rain in SoCal too, so needed. Wishing you and your family a Happy New Year, Pam! 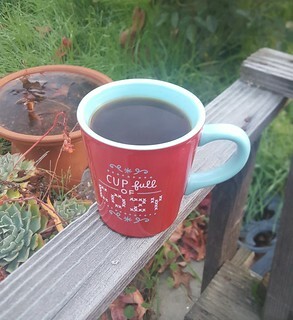 I always enjoy your blog posts, especially when a picture of one of your coffee cups accompany them :)! So I'll look forward to meeting up with you again in the new year for coffee! Enjoy your frosty leaves - we're having a traditional winter here - great for sewing days, but not so fun if you need to go somewhere. Happy and healthy New Year to you and yours. I just purchased a very fancy Pfaff combo sewing/embroidery machine and have tons of things I want to make with it!! I don't comment much, but I wanted to thank you for a great year of following your blog. So many pretty things here! Have a terrific 2017!